The Christian Arts Foundation (Chraft) presents the most anticipated event this year, ‘Revival Breakthrough 2019 with Pastor Gersson Edinbaro’. The meeting will be held on 17 March at the Viharamahadevi Open Air Theatre from 7. 00 p.m. onwards and will be open to the public free of charge. Pastor Gersson and his team will lead in worship, pray for God’s blessings and peace in our country. 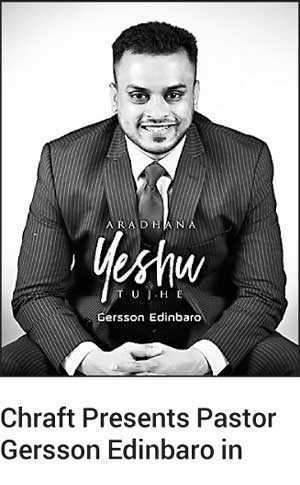 Pastor Gersson is a young Indian preacher empowered to minister a life-changing message. Having graduated in Theology, he served as a pastor for four years and is presently traveling widely to preach at conferences and gospel crusades worldwide. Together with his wife Angelina, he continues to carry the power of the gospel to many places, helping believers discover their destiny, purpose and authority and is attracting many souls for Christ.